A cryptocurrency account that pays part of the band’s salary was among those frozen as a result of the suspension of trading. Members of a Japanese girl pop group, the Virtual Currency Girls, said on Monday they had refused an offer to be paid in yen and would stay loyal to cryptocurrencies despite a $530 million cyber heist jeopardising their chances of getting paid. A cryptocurrency account that pays part of the band’s salary was among those frozen as a result of the suspension of trading at Tokyo-based Coincheck exchange on Friday following the theft of NEM, one of the world’s most popular digital currencies. “Our manager offered to pay us in yen, but we declined,” said Hinano Shirahama, who is the band’s bitcoin character. Dressed in maid costumes and wearing wrestling masks adorned with fuzzy pom-pom ears and cryptocurrency symbols the eight Virtual Currency Girls are a pop music manifestation of the digital currency frenzy that has swept Japan and other parts of the world. Shirahama and other group members said they would stay together regardless of the setback. Formed by an entertainment promoter the band debuted this month and have yet to garner a significant following. 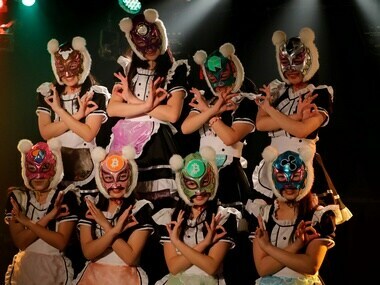 Virtual Currency Girls, which performs songs such as “The Moon, Cryptocurrencies and Me” are paid in cryptocurrency for tickets and merchandise at their concerts. Regulators fear both the rampant speculation in cryptocurrencies and risk that the markets could be used for funding criminal and terrorist groups. Japan’s Financial Services Agency (FSA) only began requiring exchanges to register from April 2017. Half of the 32 operators are still awaiting approval. In 2014, Japan’s Mt. Gox, which once handled 80 percent of the world’s bitcoin trades, filed for bankruptcy after losing around half a billion dollars worth of bitcoins. Last month, South Korean exchange Youbit shut down and filed for bankruptcy after being hacked twice. Japan’s FSA on Friday criticized Coincheck for failing to take adequate security precautions to foil hacking attacks and said it would begin inspections at other exchanges. “Coincheck has some responsibility, but the real culprit is the hacker,” said Koharu Kamikawa wearing her fur-eared mask with the NEM cryptocurrency logo on her forehead.